Because Florida waterways are environmentally sensitive and are considered by the water authorities to be owned by the public, the building of a boat dock involves environmental as well as property rights issues. The St. Johns Water Management District issues regulations and applications for boat docks in Lake County. Applications are granted based on the environmental and public impact. Do not automatically assume you can build a dock on your lakefront property. If you wish to build a boat dock on property that does not currently have a dock, you must make sure your application will be approved before purchasing the property. Make no assumptions about your dock and insist that your Realtor creates a contingency in your sales contract making sure the building of your dock is a viable option. In addition to the approval of the dock itself, there are regulations pertaining to the size of the dock you can build and the location. On canals and in some communities, there are restrictions against building a dock that will impede navigation or block the view from your neighbor’s home. The following information is taken directly from a Lake County Department of Growth Management article entitled "Everything you wanted to know about zoning... but were afraid to ask." Private boat docks and ramps are permitted as an accessory use within all residential zoning districts. Private boat docks and ramps must meet the front and side setback requirements of the residential zoning district within which that are located; and in the R-3 Medium Residential District, the side setback is 25 feet from the property line. A common private boat dock or ramp for the private use of two or more lots is encouraged and must meet the setback requirements of the zoning district in which it is located. However, the setbacks will be applied from the two outermost property lines of the lots upon which the dock or ramp is located, i.e. not from the internal property lines of the lots which are sharing the dock or ramp. Private boat docks and ramps are only permitted as an accessory use on a residential lot on which a main residential structure is located or on a lot owned by the property owner and adjacent and contiguous to the residential lot. A lot is considered adjacent and contiguous if a substantial part of the lot actually touches the first residential lot or is separated by a road right-of-way which physically divides both lots. Private boat docks and ramps are not permitted on lots that are not adjacent and contiguous to the residential lot on which the residential structure is located. 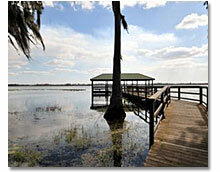 If you have questions about Florida lake boat docks, please contact us.